Shiny Kyurem in game: 108 Who? Important notice! Pokemon Shiny Kyurem is a fictional character of humans. Kyurem (Japanese: ???? 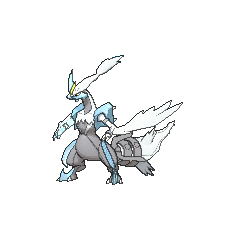 Kyurem) is a dual-type Dragon/Ice Legendary Pokémon introduced in Generation V.
While it is not known to evolve into or from any Pokémon, it has two other formes, which are activated by using the DNA Splicers on it and either Reshiram or Zekrom, resulting in a process called Absofusion that removes Reshiram or Zekrom from the party until the fusion is undone. It will then become White Kyurem (with Reshiram) or Black Kyurem (with Zekrom). However, it is impossible to own a White Kyurem and a Black Kyurem at the same time legitimately, as the game rejects the second fusion of Kyurem with Reshiram/Zekrom, and Kyurem cannot be traded or placed in Pokemon Bank while fused. Kyurem has two alternate forms, White Kyurem and Black Kyurem, which are formed by combining with Reshiram and Zekrom, respectively, and share many aspects of their designs with them. 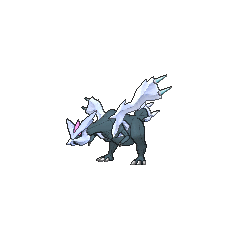 It can use Absofusion on their respective Dragon Stones to change to White or Black Kyurem. When transformed into either, its legs are just like before, but shorter and the middle toe is now ice. 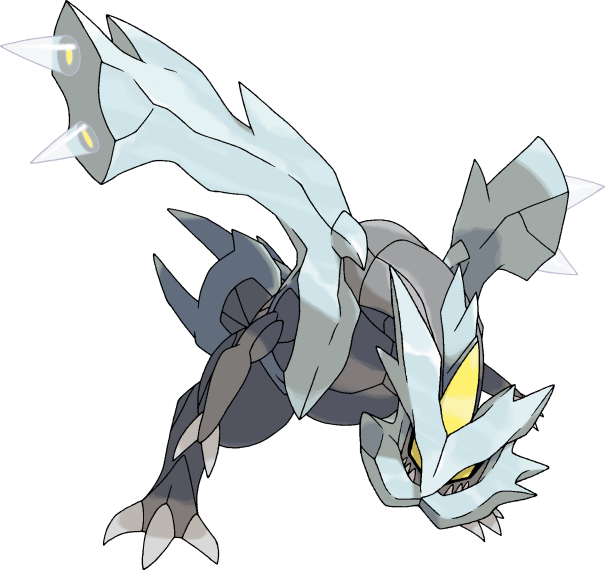 As White Kyurem, it has some extra icy details on the legs. 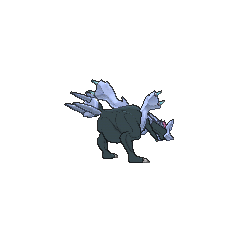 Its tail resembles that of Reshiram or Zekrom, but they are attached to the body with three gray parts of skin. The tail is capable of movement and contains four holes: they are horizontal on White Kyurem and vertical on Black Kyurem. The torsos of each form are similar, but White Kyurem's torso is more slim than Black Kyurem's bulky torso. Its shoulders are covered in 'squares' of ice with two pins protruding from each which can come out and 'plug in' the aforementioned holes. 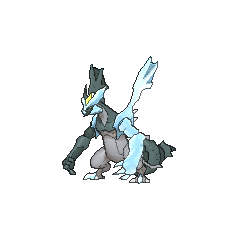 As White Kyurem, it has thin arms with two rings and three claws each, wings between the rings on its forearms, and its right arm and wing are frozen. 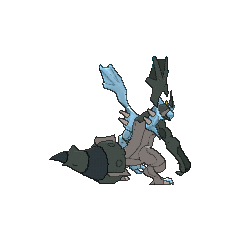 As Black Kyurem, it has Zekrom's arms, but more muscular and without wings, and its left arm and wing are frozen. 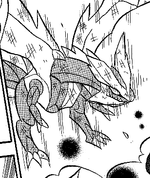 Its neck is the same shape, but is now upright; White Kyurem uses Reshiram's fur and Black Kyurem uses Zekrom's skin. In both forms, the ice covering one of Kyurem's jaws (upper for White Kyurem, lower for Black Kyurem) has partially disappeared, allowing it to move its mouth. Kyurem, in all of its forms, made its debut as one of the stars of Kyurem VS. The Sword of Justice, along with Cobalion, Terrakion, Virizion and Keldeo. 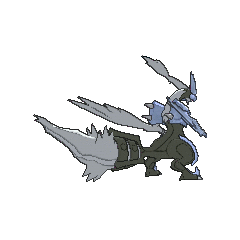 Kyurem was challenged by Keldeo, who wasn't ready to fight Kyurem, but arrogantly claimed that he was a Sword of Justice. After the terrified Keldeo fled during the middle of the fight, Kyurem relentlessly pursues Keldeo in order to finish the battle they had started. Along with the other Legendary Pokémon present in the movie, Kyurem can speak through telepathy. 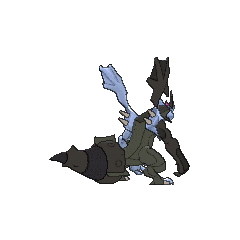 A Kyurem appeared in Hoopa and the Clash of Ages, along with the other members of its trio, the Eon duo, Arceus, Lugia, and Regigigas. 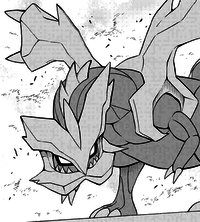 Kyurem appeared in the manga adaptation of Kyurem VS. The Sword of Justice. 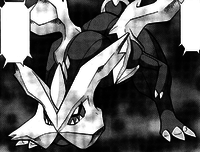 Kyurem appeared in the manga adaptation of Hoopa and the Clash of Ages. Kyurem debuted in Mr. Perfect in a fantasy. It was the subject of a conversation between Cheren and Drayden. Kyurem is the only Pokémon with a base stat total of 660. 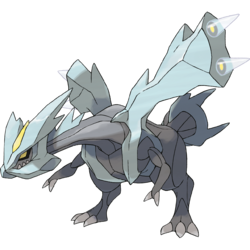 Kyurem is the only member of the Tao trio that cannot learn its respective Elemental Fang. Although several Pokémon are the result of two or more individuals combining (Dugtrio, Slowbro, Slowking, Magneton, Metang, Metagross, Weezing), White Kyurem and Black Kyurem are the only ones to be shown doing so in the core series games. They are also the only fusions that are not part of a Pokémon's evolution and are the only fusions which have been shown to be reversible. Kyurem is the only Pokémon to be the game mascot of both versions of a paired version. Despite being larger when fused, both fused forms are lighter than the Pokémon it's fused with. Kyurem has the most separate cries used in-game, with five. It has one for each forme and two longer cries that play in stereo. Normal Kyurem's effort value yield of 1 HP, 1 Attack, and 1 Special Attack is unique. Kyurem may be a combination of ? rei (cold), ?? kyuurei (rapid cooling), or ? yuki (snow) with the kana reversed, and ? mu (nothing). It may also derive from ? rei (zero). Rem may also mimic the rom of Zekrom and the ram of Reshiram.